Repent. Prepare the way of the Lord. Make his paths straight. Valleys shall be filled. Mountains and hills shall be made low. The crooked shall be made straight. The rough ways shall be made smooth. By themselves those words have no meaning. They need context. That’s true for any word. We might be able to define a word but it really has no meaning until we understand the context in which it is spoken. I think that’s why St. Luke is so specific in today’s gospel (Luke 3:1-6). He sets the coming of God’s word in a specific context; naming a time, people, and places. It was the fifteenth year of Tiberius’ reign as emperor. Pontius Pilate was governor of Judea. Herod was ruler of Galilee. Philip was ruler of Ituraea and Trachonitis. Lysanias was ruler of Abilene. It was during the high priesthood of Annas and Caiaphas. That’s when and where God’s word came to John son of Zechariah in the wilderness. That’s the context for John going into the region around the Jordan and speaking God’s word. The echoes of John’s voice can still be heard. They are everywhere. That word he spoke at the Jordan River continues to be spoken in all times and all places. But it needs context. So I’m going to follow Luke’s lead on this. I want to set the coming of God’s word to us in a particular time, place, and circumstance. This is not the sermon I wanted to preach today but given what has happened it is the sermon I could not not preach today. So here we go. On the 336th day of the year 2015 in San Bernardino, California, the United States of America had its 355th mass shooting of the year, and the second of the day.1 On that day and in that place fourteen people were murdered and twenty-one were injured. Two suspects were killed and two police officers were injured. All tolled sixteen people died and twenty-three were injured. And once again the word of God came to God’s people. Repent. Prepare the way of the Lord. Make his paths straight. Valleys shall be filled. Mountains and hills shall be made low. The crooked shall be made straight. The rough ways shall be made smooth. What does that mean in the context of the San Bernardino shooting? What would repentance look like? They aren’t hard questions. It’s not too difficult to understand what today’s gospel might mean. At a minimum the very least it can mean is “Stop it. Just stop it. For the life of the world stop it.” That’s not the full extent of repentance but it’s a good starting place. The dead will be buried, the wounded will be treated, and the sorrowful will cry. There’s nothing new about any of that. A lot of that was the response to the previous 354 mass shootings and the coming of God’s word in those times and places, and it’s already begun again following the 355th. I’m not saying those things are wrong or that they shouldn’t be done but let’s not kid ourselves. That is not repentance. It’s just not. Those things do not prepare the way, fill the valleys, lower the mountains and hills, straighten the crooked, or smooth the rough. They change nothing. Meanwhile you, I, and America wait and watch, wondering when, where, and who will be number 356. The repentance John proclaims on God’s behalf, then and now, demands a change of heart, a change of mind, a change in how we speak and act. It demands a change in our life’s direction, a change in our country’s direction, a change in our priorities and values. This change, this repentance, is not a one time event. It’s a process we live into. It has to become our daily practice, a way of being, living, and relating. 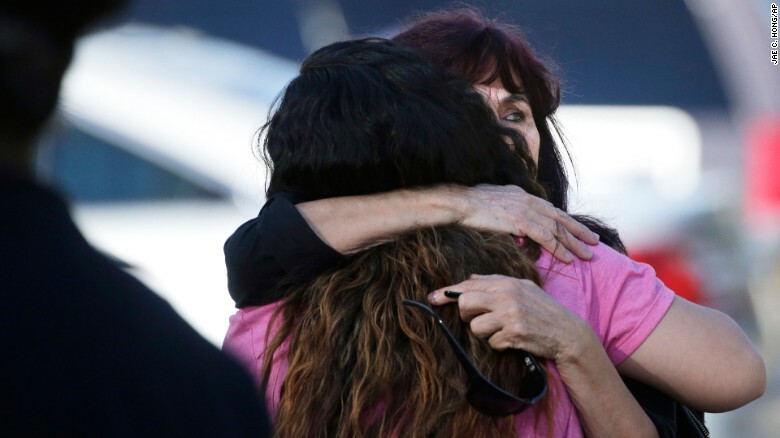 So what does repentance look like for you in light of the San Bernardino shooting? What will you change about yourself and your life? What will you do differently? How will it affect your choices, values, and priorities? Will your response help prepare the way of the Lord? All. You and me included. We are responsible to God, to each other, to the world. This is about number 355 and our responsibility to the dead, wounded, and grieving of San Bernardino, and it is about so much more. Don’t you see what is happening to us? Humanity is bleeding out and the soul of the world is hemorrhaging. We have been given a sacred trust and we have a responsibility. To deny our responsibility is to refuse to repent. There can be no repentance without taking responsibility. John’s voice will not be silenced. God’s word remains. Repent. Prepare the way of the Lord. Make his paths straight. Valleys shall be filled. Mountains and hills shall be made low. The crooked shall be made straight. The rough ways shall be made smooth. So what do you think? Can we do it differently this time? I think we can. Christ has shown us a different way, a different life. I believe we have been given what it takes. Isn’t that the hope of Advent and the promise of Christmas? Isn’t that really what the Advent-Christmas cycle is about? Preparing for and giving birth to Christ in our time, in our place, in our circumstances. That’s repentance. That’s taking responsibility. Yes, by God’s grace, we can do it differently this time. But will we? Will we do it differently this time? That’s a different question. That’s the harder question and the answer remains to be seen. If you want to know the answer to that question don’t look to our politicians, police, or military. Don’t give yourself to popular opinion or the loudest voices. Don’t look at ISIS or Islam. Look within yourself. The answer lies within each one of us. Whether we do it differently this time is a question only you and I can answer and each one of us answers that question every day of our life. So, what’s your answer? How will you answer the call to repent? 1. Christopher Ingraham, The Washington Post, December 2, 2015. See also Mark Follman, The New York Times, December 3, 2015. 2. Abraham J. Heschel, The Prophets (NY: Harper Perennial Modern Classics, 2001), 19. I think it is important to understand that God’s presence is peace; and despite the sporadic violence that occurs world wide, by the minute. God’s peace rules. One way it comes into our existence, is through our own meekness and humility by the way of Christ Jesus. So, first, repent, but then do God’s will. Thank Darrell. I suspect that repentance in some way opens us to see and experience the peace of God. Wow, Such a powerful call to us!! I heard Trump’s latest rant and was sick at my stomach! We truly MUST repent – turn around – and live the Gospel of Love. Blessings to you, Dear Voice in the Wilderness! I always appreciate your encouraging words. Thank you Jan. This is especially meaningful when I follow it with your sermon in 2012, “Repentance Means Becoming Human.” Thanks, Mike. Yes, so in some way to not repent is to live less than human. The violence is not humanity at work but our inhumanity. Thank you for this timely message that reminds us to stop, think and remember that we are all a part of God’s creation. The life of Jesus teaches us to be responsible to one another and to reach out in love. “Be still and know…”. Thank you Beverly I like the way you link responsibility and reaching out. To “be responsible” and “reach out in love” is to recognize that we live a shared life.